Finally the weather is looking more like summer and this means we can play around with the kitsch and summery product! We love cute prints and when discussing what post we could do next, fruit prints was something we just had to cover! What better way to scream the sun is out than with a fruit salad tee or a pineapple crop top! Since designers like Jeremy Scott made food on clothes hot, the high street is full of fruit prints which add the playful and fun factor into this seasons heat wave! Why stick to plain summery clothing when this is the time to be wearing it loud and wearing it proud! I went pineapple crazy after finding these perfect items in H&M. 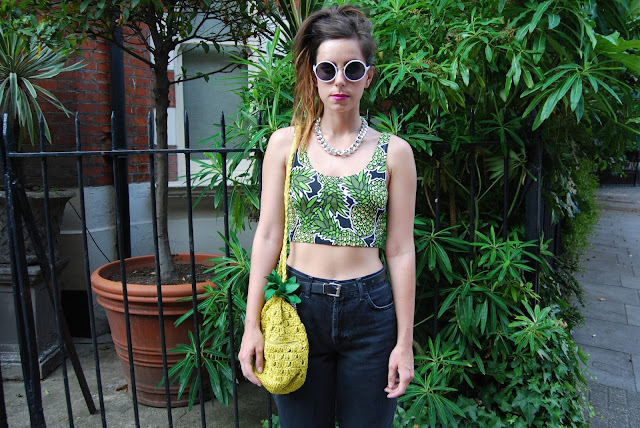 Pineapple print crop top and wicker pineapple bag were perfect for the look I wanted to achieve. You must know by now here at TSOP we never take ourselves or our outfit choices to seriously and always remember we are still young girls and love having fun! This post is exactly what we mean. If I can't wear a pineapple crop top at 23, then when can I wear a pineapple crop top?! I decided to wear it with my new high waisted jeans by Topshop Boutique which I absoloutely LOVE! The fit is perfect and the ripped knees are just enough for me. I feel so comfortable and confident in them and they look great with a crop top for summer. Accessorised with a silver chunky chain, white round sunnies and my bright yellow wedges which made the look super summery! The pineapple wicker bag added a touch of playfulness to the look and I feel it's a look Rihanna would be proud of! Are you being a 'fruit fool' like Amy and myself this season? I love how you paired the pineapple pieces together, such a great look! I hope my H&M gets them! Those shoes are AMAZING! What an outfit, what a beauty Naomi. I love that crop top!! So cute!